She was in Kenya When She Became Queen. 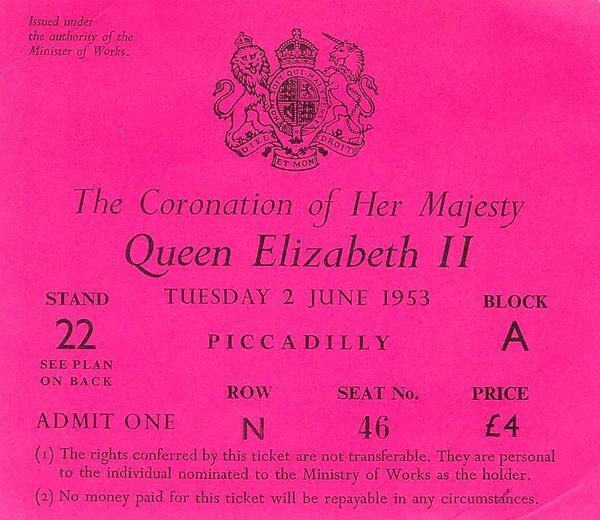 Copy of an actual ticket to Queen Elizabeth II's coronation ceremony in 1953. Image source: WikiCommonsAt the time of her father's passing, Elizabeth was with her new husband in Kenya. The two had made a pit stop there on their way to Australia and New Zealand and had just returned home from a night on the town when word arrived of George's death. Phillip broke the news to the new young queen, and the royal party quickly returned to London where they immediately moved into Buckingham Palace. Though her coronation ceremony wouldn't occur for several more months, Queen Elizabeth II had begun her epic reign that spans all the way to today. She's 92-years-old and Still Has a Drink Before, During, and After Lunch Every Day.The Queen is said to be quite the fan of gin and is known to have a cocktail of gin and fortified wine (with a slice of lemon) before lunch every day. Then, she drinks wine with lunch, a martini in the afternoon, and has a glass of champagne in the evening. At 92-years-old, why not get a little loose? Prince Phillip Isn't the Only Man Who Has Been in Her Bedroom.In 1982, a man named Michael Fagen snuck into Buckingham Palace not once, but twice in the same month. It was on his second adventure that he managed to sneak into Elizabeth's bedroom where he found her in her nightie. The original story was that the Queen kept her cool and ended up having a long conversation with Fagen before security came and apprehended him, but Fagen remembers it differently: he claims she scurried past him barefoot without saying a word. The Queen's head of security offered his resignation as a result of the break-in, but she graciously declined the offer and asked him to stay on. She's Visited 116 of the 195 Countries on Earth. Queen Elizabeth with President Ronald Reagan. Image source: WikiCommonsElizabeth has long been a fan of travel. She first visited the United States before she ascended to the throne while Harry Truman was President and throughout her time as queen, has gone on 256 official state visits to 116 different countries. And she's only slowed down slightly in her old age—she visited 43 new countries after turning 50 and has made recent visits to Germany, France, Ireland, and Italy. This story about her & President Reagan is making the rounds. I wonder if it’s it true. 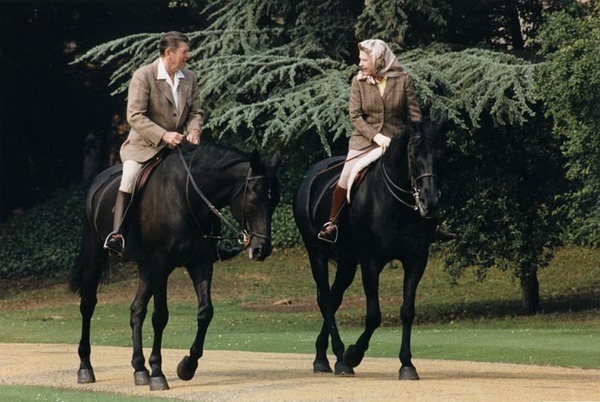 The Queen decides she wants a Kentucky thoroughbred in the royal stable, so she calls President Reagan, who decides to meet her in Lexington, Kentucky. When they get there, they decide to go for a ride. They're just pulling out of the barn when the Queen's horse's tail goes up and "Lbbttt!" --out comes a monstrous fart. 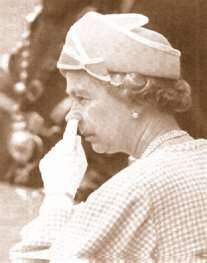 The Queen says, "I'm so embarrassed!!" Reagan says, "You shouldn't be!! I thought it was the horse!!" She Brings Her Own Toilet Paper on the Road.Despite being an experienced traveler, The Queen doesn't pack light. In addition to dozens of outfits, her own food and water, and even a personal supply of blood that matches her type, Elizabeth brings her own toilet paper wherever she goes. You can recognize it by the special seal holding each fresh roll together—only Phillip or The Queen herself are allowed to break it. I understand that she has an employee whose sole job is to pull her chair into or out from under the dining table when she wishes to be seated or stand up. I further understand that once, at a state dinner, she stood & then leaned forward to speak to a guest. He had already pulled out her chair when she decided to sit down again. He failed to read her mind & she sat down--on a chair that wasn’t there! Her Royal Bottom (or “bum” as they say on her side of the pond) came in contact with the floor. Bud plays these little jokes on me all the time. Please do NOT tell me this is not true. I like the story & will continue to believe it. I have it on very good authority (digitaljournal.com) that her grandsons, William & Harry, once changed the outgoing message on her phone to say, “Hey, wassup?” & that they also put this message on her personal answering machine: “This is Liz. Sorry I’m away from the throne. For a hotline to Philip, press one. For Charles, press two. And for the corgis, press three.” This is why I’m reluctant to have my grandchildren touch my cell phone. We will never stop carrying a torch for plants — they are way more amazing than most people give them credit for. They can hear oncoming attackers, & many send noxious chemicals into their leaves to fight back. Some even have a primitive sense of sight. So believe me when I say this: They don't like it when you pet them. According to research, they have a very strong reaction to touch. Plants' hatred of cuddles is nothing new to scientists. In the early 1960's, for instance, scientist Frank Salisbury was studying how cocklebur plants grew by measuring their leaves with a ruler every day. Weirdly, he noticed that the plants he was measuring didn't grow as much as their neighbors & they eventually shriveled up & died. He concluded that it was simply the act of touching the plants that killed them. A decade later, a plant physiologist named Mark Jaffe published the first work on this phenomenon & coined the first word for it: thigmomorphogenesis (in Greek, thigmo means "touch," morpho means "shape," & genesis means "origin."). Of the dozen or so plant species he used in his study, six had slowed growth after being touched daily. After a few more days of no touching, however, they resumed their regular growth rate. In 1990, plant biochemist Dr. Janet Braam discovered that this stunted growth happened because of a genetic change. Touching a plant led to a specific handful of its genes being activated, which she named the "touch" (TCH) genes. In December, researchers at La Trobe University in Australia took a closer look at this phenomenon to uncover exactly what was going on inside of the plant to activate these genes. For their study, the researchers used a plant called thale cress (Arabidopsis thaliana), a plant that's known to pump its leaves with toxic mustard oil when insects attack. The scientists stroked the leaves of the plants with a soft paintbrush every 12 hours, then measured their biological response at varying periods of time after each stroke. They found that within 30 minutes of being touched, 10 percent of the plant's genome had been altered. At the site where the plants had been stroked, their mitochondria had ramped up their activation of genes known to suppress the touch response. Even more interesting, the same thing had happened at other places on the plant that hadn't been touched, though to a lesser degree. Specifically, the mitochondria altered the genome by tweaking the plant's immune system & hormone levels. "This involves a huge expenditure of energy which is taken away from plant growth. If the touching is repeated, then plant growth is reduced by up to 30 percent," said professor Jim Whelan, the lead researcher on the study & research director of the La Trobe Institute for Agriculture & Food. Why would this be? It makes sense for a plant to send out toxic chemicals when it feels the brush of a caterpillar since that could help convince the predator that it's not a tasty snack. But to inhibit growth after too much touching? That seems like cutting off the nose to spite the face. But there's some logic there. For example, if plants grow too close together, they'll get less light & fewer nutrients. Growing smaller could be a way to ensure that there's enough to go around, co-author Dr. Yan Wang explained. This new research might help farmers know exactly how far to space their plants to ensure they grow as big as possible. Knowing the genetic mechanisms at play in a plant's touch defenses might even help scientists engineer plants that aren't as touch sensitive. For that, though, they have to be careful, since it could be easy to knock out some other important senses in the process, like sensitivity to cold & heat & disease defense. But as for houseplants, the message is clear: water them, give them sunlight, even play them music if you'd like to. But don't pet them. They don't like it when you pet them. I've posted this the last several years on this date because it just seemed like the right thing to do. I've left in the old cartoons & added a few new ones.